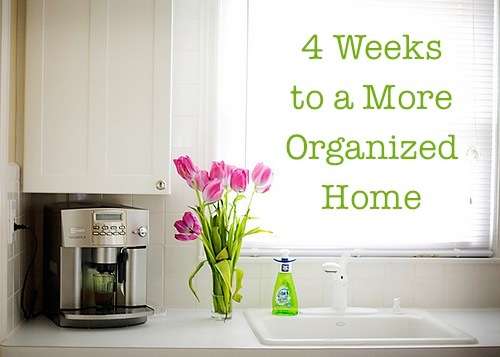 Can you believe we’ve been at this 4 Weeks to a More Organized Home Challenge for two weeks now? I’m so proud of all of you for the progress you’re making and the hard work you’re putting in to make your homes more of a haven. Your posts and comments have been a huge inspiration to me! Keep them coming! ::Dust all ceiling fans and clean all light fixtures in your house. Check for burned out light bulbs and replace. i think you were reading my mind when you wrote todays assignment. I just got done telling my husband last night that it needs to be done before we move on tuesday. Todays task is something that definitely needs to be done here!! Those ceiling fans definitely need some attention, but we also have skylights that have some dusty webs…I confess the last thing on my list. 🙂 This has been fun and a good reminder of how quickly things can get done with some planning. I am really struggling doing these daily, which of course, creates its own guilt. I am going to catch up on them this weekend and start fresh on Monday! No guilt, okay? Just do what you can do — and don’t worry about what you can’t do! Even if you only get one thing off the list done this week, you are ahead of where you were last week! I haen’t been able to “keep up” either … but I did clean out my fridge yesterday so I’ll call that a success!! I plan on keeping a list of Crystal’s “bolded items” (and maybe her 15 minute items too) and just tackling them as I have the time. wow glad I looked at this one early. I have a lot of light fixtures in my home and 2 ceiling fans. Some are extremely high and will require digging out a ladder. You are inspiring me, my head is whirling as to how to keep this up after the series is over, I feel like I am finally finding my cleaning groove. I’m loving your posts. You’re an inspiration! So what about when we complete the 5-7 things, do we make a list of 5-7 more or just stop for the day. That’s up to you! I usually have trouble getting my entire to do list done and I get discouraged and defeated if I make this huge list and only get to a little bit of it, so that’s why I try to stick with 5-7 things. No! No! I don’t wanna replace light bulbs! I find SPIDERS when I do that! … okay. I think I’m better now. I agree! Our 21 yr old daughter got bit by a black widow and has ben horribly sick from it. We had to go and bring her home frem college for a few days. She could not even drive herself home. No spiders!! My track record for changing bulbs is: One smashed globe cover in the laundry room. Two dead but extremely horrible-looking brown recluses in the globe the last time I changed the hall light. And today I smashed a CFL trying to change a bulb in the bathroom, which I thought was safe since the bulb was exposed. I think hubby gets all the bulb-changing tasks in the future. I already threw 3 things away because I thought I’d have to get rid of 9 for the day! I think I am running out of clutter! I am hoping to jump on the band wagon today. Looks like a picked a good (ay) day to do it – hate dusting lights! Ha! Thanks for this. I love this day by day organization. We were at a marriage retreat part of the week so I’m playing catch up now. The kids and I got the doors, light switches and baseboards finished today while supper was cooking. I worked on some ceiling fans last week. Tomorrow my son and I are going to find a place to vacuum out the car. Most of my 7 items have been items to throw out that were broken. Loving this series!!!!! Getting a lot done…i even had time to soak in the tub today while my 2 month old was sleeping 🙂 BONUS! Today is my first day reading the cleaner home assignments. I am really excited to start! I have a dusting mit from norwex and hope it speeds this process up. We have 7 ceiling fans and I have some of them that haven’t been dusted for a while. Oops! Thank you for posting this I am trying to make my house chemical free because of my children and can’t wait to read back onthe other 9 assignments and see if there are a few my children can help me with. Yuck…needs done! Today my husband and I are tackling our garage! We’re getting ready for 10 of his family to decend upon us starting next Friday…we’ll have people in and out for 9 days! I have been in cooking and cleaning overdrive getting ready. Def have to tackle those dusty fans! playing with your children is way moer improtant. They will nto remember if your fans and light switches were clean but will remember that you loved them. I hope to do these challenges this weekend and recruit my kids to help…they are each going to pick 1 or 2 to work on with me so I can catch up and have it take less time. I am loving this series!! (Though I am going to have to purchase more lightbulbs while I am in town today!) We are getting our home ready to sell, adn this series is offer practical and EASY steps to get the house in tip-top shape. Also, the junk sorting is helping, as it is overwhelming to sort the donation items from an entire house, but to sort out 7-10 items a day is easy! Thank you for your help, Crystal! I wish this series would continue because it’s really helping me. I am 4 months pregnant and I’m finally getting back in the swing of things – 4 out of 5 days this week I’ve actually made a to-do list…and completed most of it! Thanks for helping me get out of that 1st trimester slump – this was great timing! And with the decluttering – I realized yesterday that I can give all our old stuff to my friends who are raising missionary support and are planning a yard sale. Decluttering just got more meaningful. This sounds so familiar! I’m almost 6 months pregnant, and we have friends having a benefit yard sale for their upcoming adoption later month. 🙂 It feels good clearing out space for our baby, too! I can almost hear the house breathing a sigh of relief as the dust, dirt, and pounds of clutter get lifted off. I saw a cool tip on Pinterest for ceiling fans — use a pillow case to wipe off the dust from the blades. That way it doesn’t go everywhere below. I just noticed that the light fixtures needed help when I was cleaning the switch plates. Thank you so much for helping me get this house in order. I’m really enjoying the results of this hard work and I love reading everyone’s comments! This series is fantastic! I thought my baseboards were fine the other day, until I got down on all fours with a soapy water bucket and rag! Gross…even though it feels like I vacuum & swiffer all the time!!! That lead to my also washing all the floors, door knobs, switch plates…and while I had the vacuum out I got all the spider webs and lint on the walls/ceiling/vents…and light fixtures. Also washed the bathroom & bedroom doors down with a vinegar solution, got smudge marks on walls and window ledges! I also brought a car load of items to the local donation center…who would have thought I could generate this many items! This really has been inspiring! Thanks very much! Oh yes, thank you for that great reminder! Just got mine! And the 69 cent bottle of Method. And I’m home with a sick child who isn’t really sick anymore. So, really no excuses! Yep. I looked up at our ceiling fan in our room and thought, “I suppose she’ll have us do those at some point. Then I won’t have any more excuses.” Now I don’t. Except that we have 9 ceiling fans in our house. Don’t ask. can someone please help me figure out how to keep up with article daily?? Ive been lost since day four and have been searching all over the blog, now i just stumbled upon it…. help?? ?